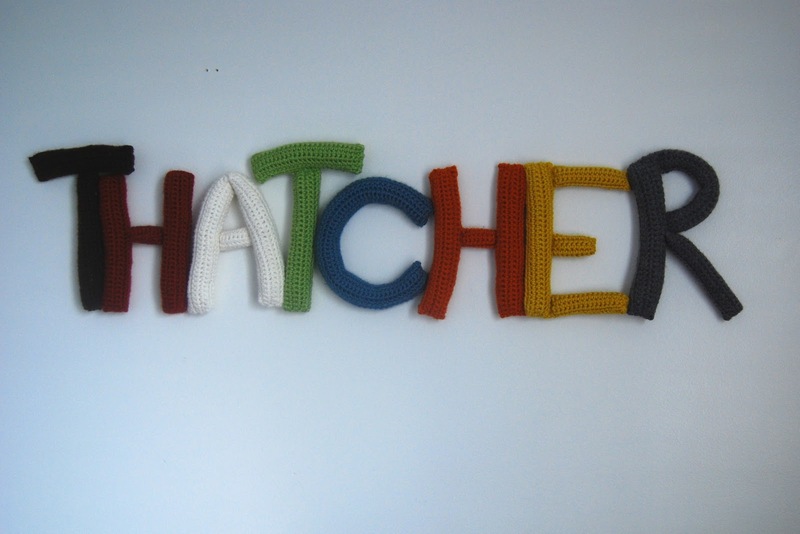 I finally finished the projects I've been working on for Thatcher's room! 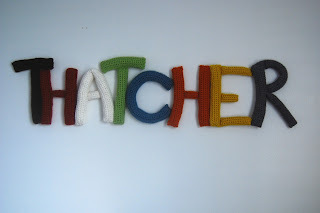 I crocheted his name and hung it on the wall over his crib, and I also made him a mobile of forest animals. They definitely look home-made, but I think they turned out pretty cute! Here's a close-up of his name. I wanted his name on the wall, but since it was going over the crib, I didn't want to buy heavy wooden letters that could fall on him. So I crocheted some -- I made them up as I went along, so they're not perfect. I wrapped a wreath form in yarn for the ring. I liked these colors together. I also made up these little mini animals -- they're all animals that are on his crib bedding. Here's the bear. I love the letters you did, and I like that they aren't all the same size. hey CUTE!! And no worries about getting his nursery ready after he's 3 months. Remember ol' Rowan didn't have a bedroom until he was 9 months old in Vegas! We'll take our time with Baby Ta-Ta too. You're so amazing!! Cute cute stuff. I love it ! so creative - I love the little animals :) He didn't notice it wasn't done before - - - LOVE IT !! Super cute. Love the Mobile. You are so creative. That mobile idea is just too much fun. I am IN LOVE with this mobile!! so adorable Sam. I am sorry that we were not able to make it to the blessing. It looks like you had a beautiful day.